The project includes upgrading 10km of Bringelly Road from two lanes to a six lane divided road between the eastern side of the Upper Canal bridge and Eastwood Road, through the future Leppington Town Centre. The remainder will be upgraded from a two-lane to a four-lane divided road with a wide central median to allow for widening to six-lanes, when required in the future. The upgrade will be undertaken in two stages to minimise disruptions to traffic. The first stage is 5.7km and will upgrade the section east of King Street to Camden Valley Way and the second stage is 4.3km and will upgrade from King Street to The Northern Road. 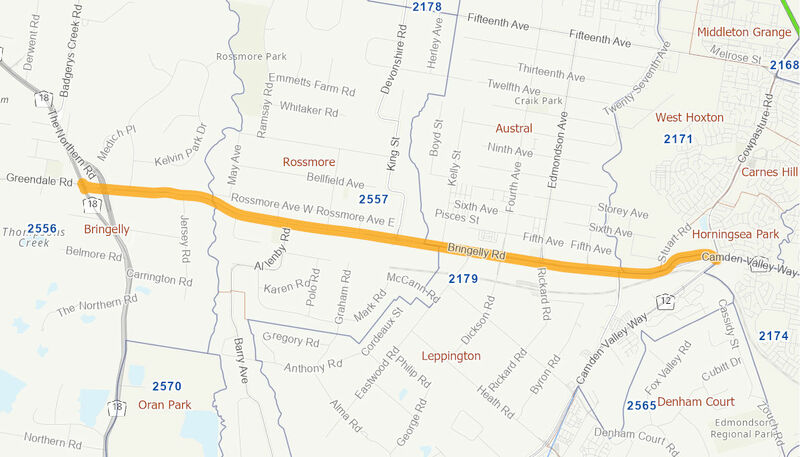 The Bringelly Road upgrade, as part of the Western Sydney Infrastructure Plan, will provide better road linkages within the Western Sydney region and benefit the region's growing population, including through reducing commuting times. The total cost of the project is $509 million. The Australian Government is providing $407 million and the NSW Government is providing $102 million towards the construction of this project. Stage 1 of the upgrade, between Camden Valley Highway and King Street, opened to traffic in December 2018. NSW Roads and Maritime Services awarded the construction contract for stage 2 in May 2017. The entire project opens to traffic in late 2020.